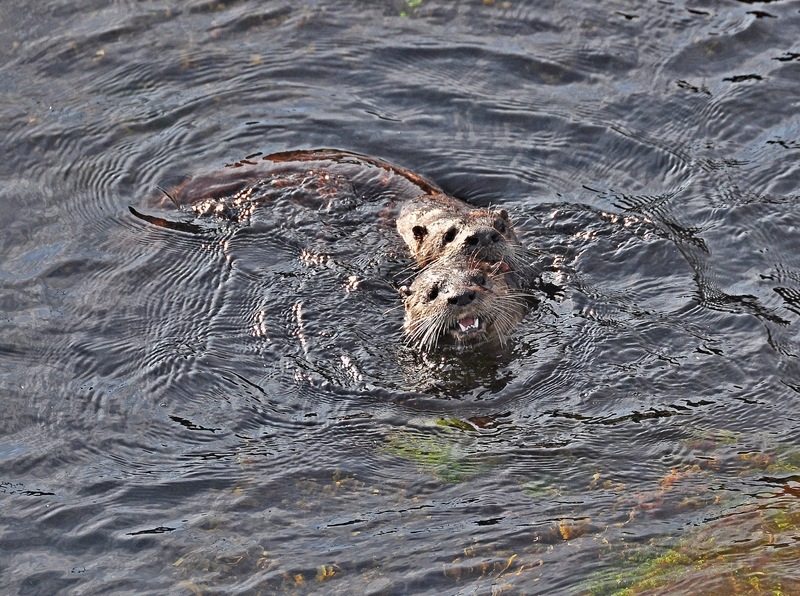 A River Otter has shown up two days in a row at Anchor Park at Duwamish Head in West Seattle. The otter has a damaged left hind foot (or it may be a growth due to eating fish from Elliott Bay) but it does not seem to hinder the otter's normal activities. 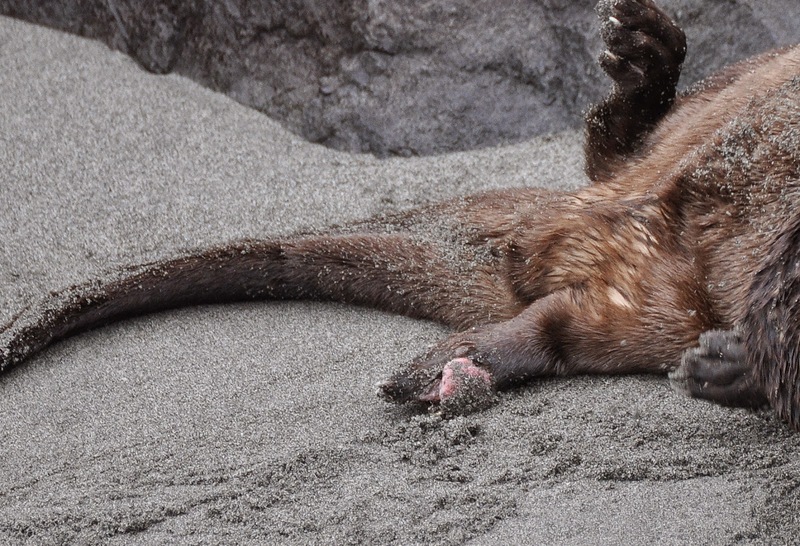 Sand baths and grooming seem to be the main activities while the otter is on the beach. 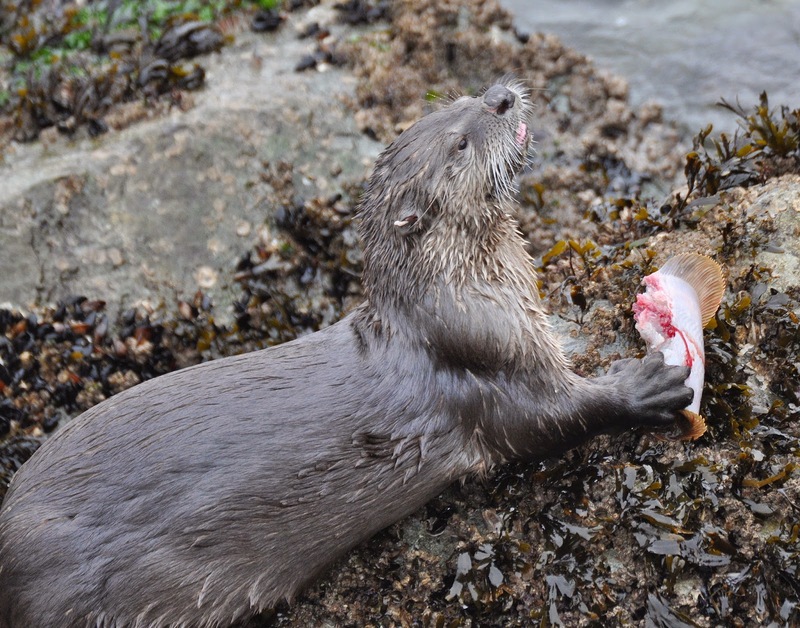 We observed the otter feeding on a Flounder (species not identified) on rocks just east of Anchor Park. 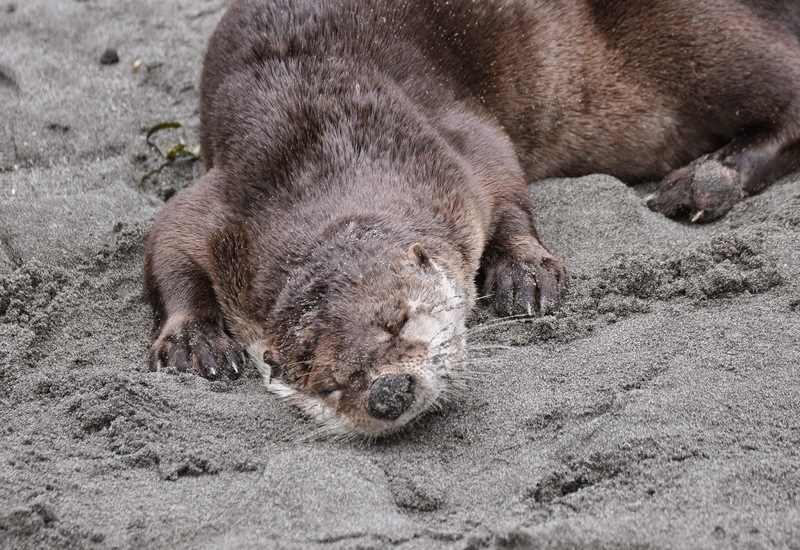 After two appearances on the beach and lunch the otter moved under the large rip-rap boulders for an afternoon nap. 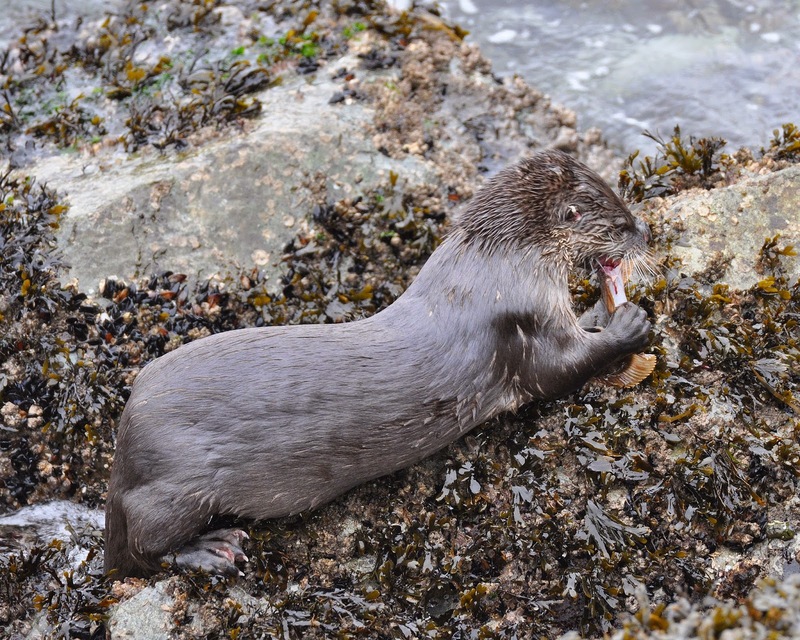 We will be checking this spot again in the coming days to see if this turns out to me a regular sand bath and eating location for this otter. 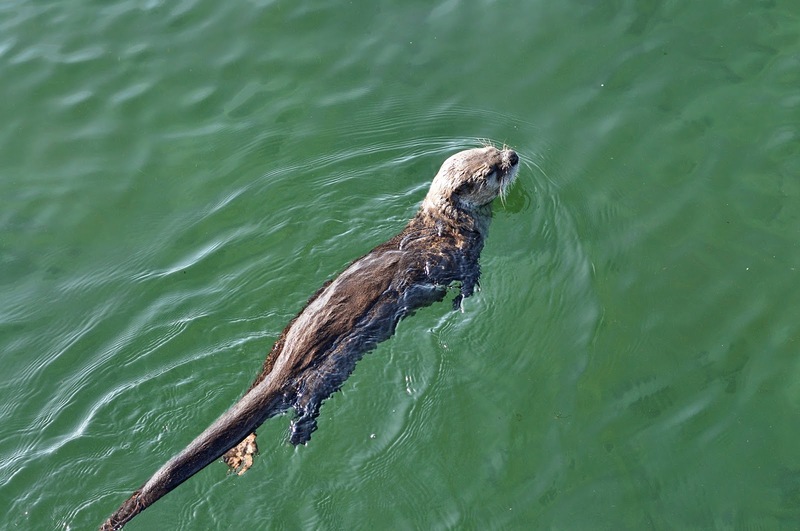 "Eat no more than two meals per month of flatfish/bottom fish from Elliott Bay". The otter has been named "Otto" But it could be a female, and has been at Anchor Park every day (Feb 24 through March 4th) entertaining hundreds of people who stop to watch as they do the Alki Trial on bike, foot, roller blades and skateboards. 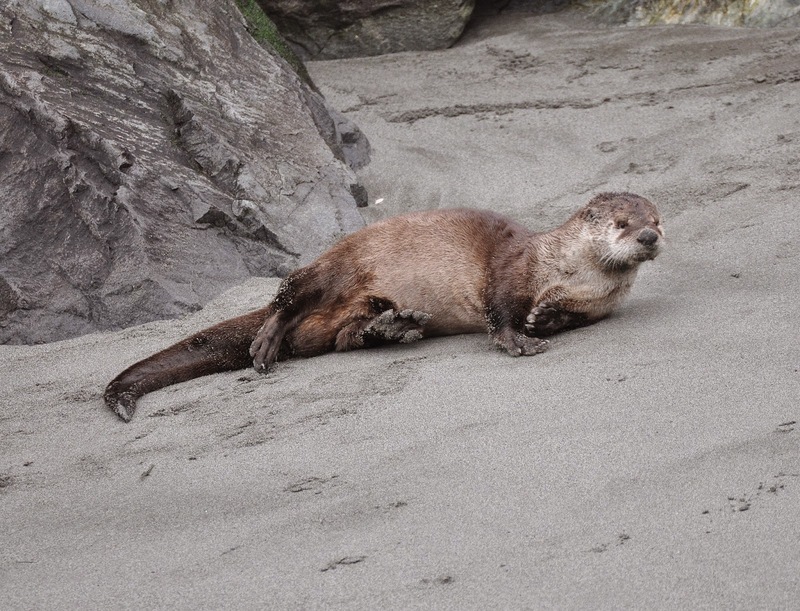 Otto is comfortable with people as close as 30 feet as they watch from street level down at the beach.....a warning sign has be posted at the top of the stairs to the beach to keep people and dogs from disturbing Otto. 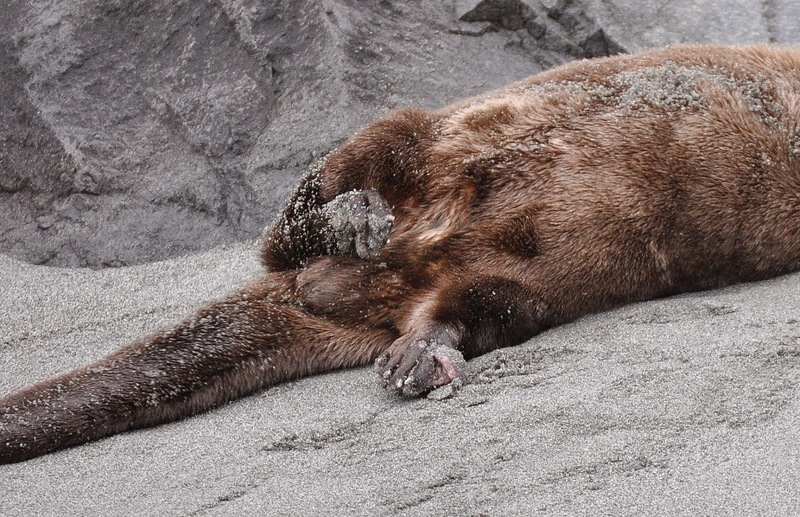 Dogs are not allowed on any Seattle Park's beaches at any time leashed or unleashed. hour to 1 hour. 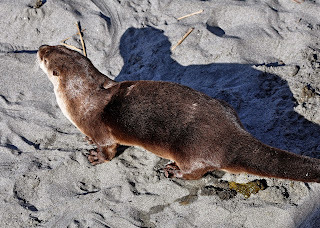 After catching a flounder Otto then returns to the beach about 1/4 mile west of his resting area and exits with the fish onto rocks next to the sea wall where he eats the catch...he sometimes goes into a drainage pipe the extends from the wall and eats there. 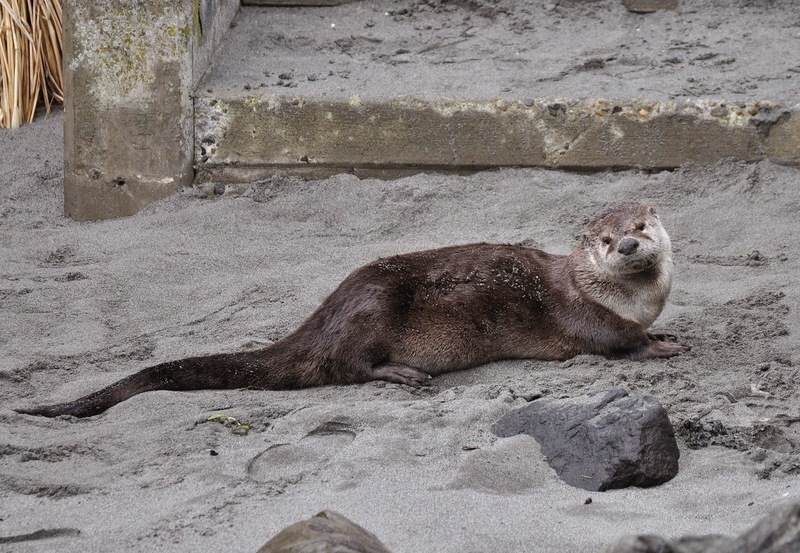 Otto usually feeds for about 1/2 hour or less and then returns to the sandy beach at Duwamish Head to rest and dry off. This pattern repeats a number of times each day. 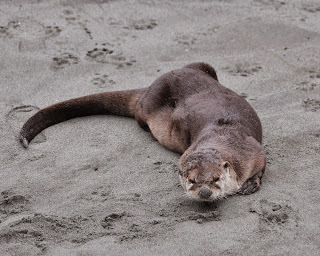 At the end of the day's activity Otto will sometimes cross Alki Ave. and go into the Alki Greenbelt where he most likely has a den. Crossing the street is by far the most dangerous time for Otto as traffic can be heavy. 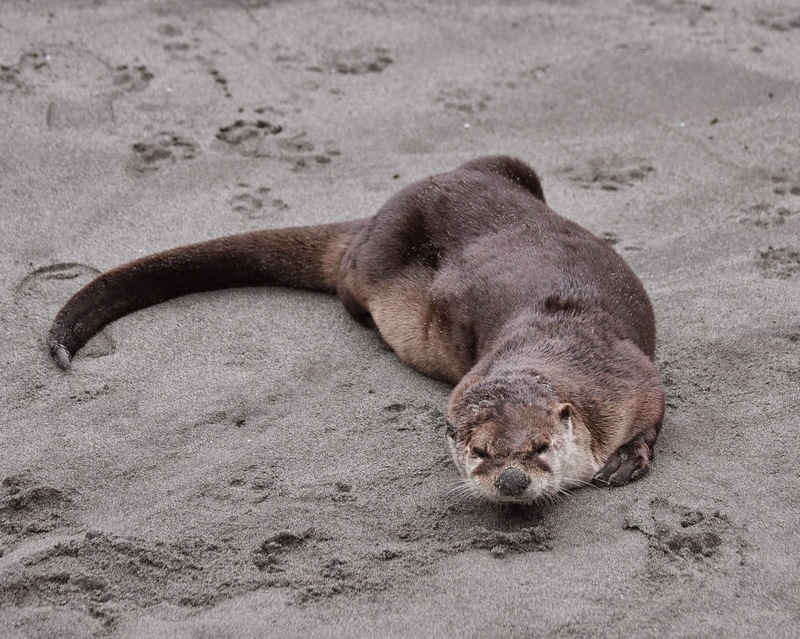 The Seattle Department of Transportation has been requested to place signage to warn driver of the otters crossing the street at a number of points. 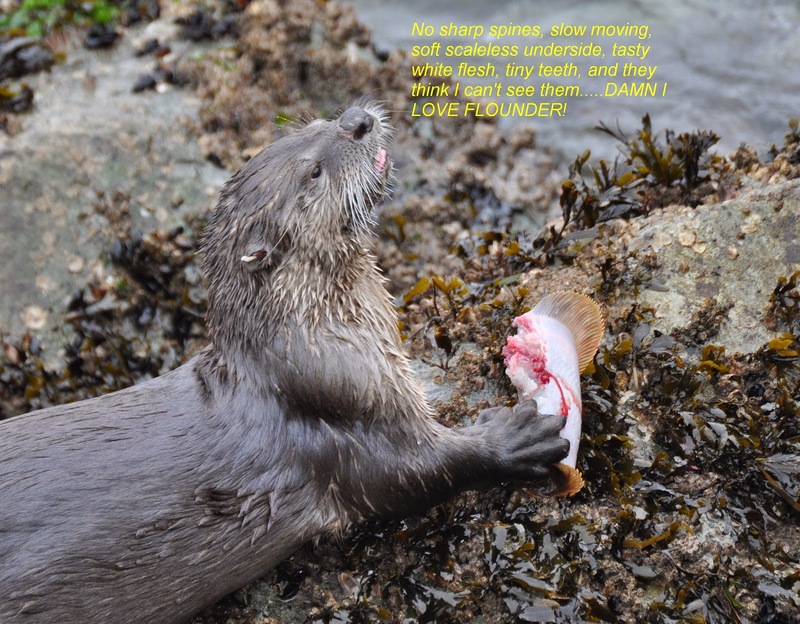 Otto did this same routine at DH in early February and then was not seen at Duwamish Head until February 24th. 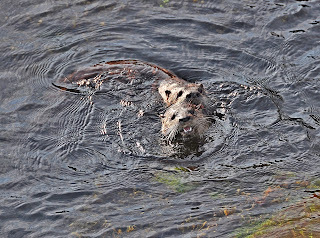 So we expect the Otto may move on to a new area again anytime and may or may not return to Duwamish Head in the future. New Images posted below. Otto went fishing at 9:30am Friday and did not return to the beach the rest of the day. He may have moved on to another part of his home range. More after we check on Saturday. 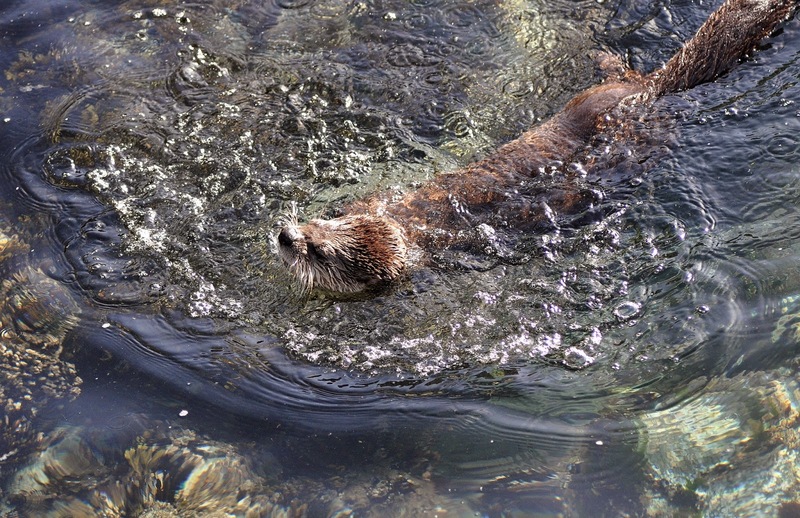 No sign of Otto on Saturday. 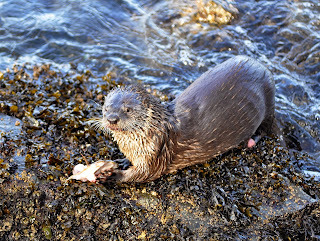 Otto was back at Duwamish Head on 3/14 doing his normal routine. However this time he added something we had not seen yet to his diet. 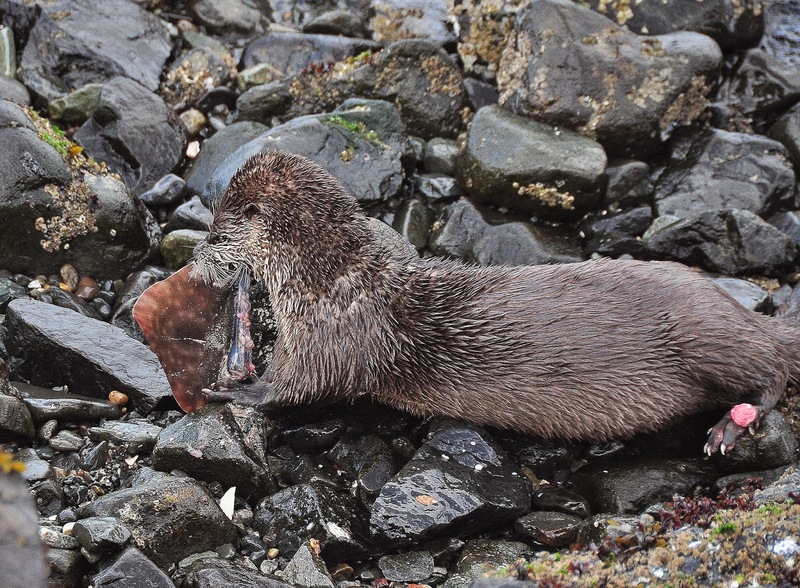 A juvenile male Big Skate was consumed. You may use any of the images for non-profit educational use. Signs are fine.